If you're planning a trip to Barcelona, you've probably already mapped out all of the excellent Spanish food you want to eat, the stunning museums and landmarks you hope to visit, and all the tapas and red wine you can stand. But after planning all of that, your wallet might need a break. Luckily, you'll be pleased to know there's plenty of free things to do in Barcelona. From free museum days to historical landmarks and vibrant markets, Barcelona on a budget is a true pleasure. Barcelona's most famous landmark may charge admission, but viewing it from the outside is free. Personally, I don't think going inside is worth it - the museum isn't especially interesting (unless you have a big interest in architecture) and the climb to the top gives you a less-than-spectacular view of the city. Of course, paying the entrance fee does at least help guarantee that they finish the building (over 120 years and counting, so far), but if you're on a very tight budget, you can still appreciate 90% of the building from across the road. Barcelona's most famous thoroughfare is a tourist attraction in itself. The street performers are there all day, every day and for a few cents will do their little party trick for you. The Plaça Reial can be found just off the main street (complete with some Gaudi designed lampposts). Read more about Las Ramblas. One of two moutains in Barcelona (the other being Tibidabo), Montjuic has a wealth of sights for those who don't mind a bit of a climb. Take a walk with a nice view of the sea, wander round the old watchtower and marvel at the Mayor's Belvedere, a collage of broken bottles and pottery by Carles Buïgas. The Museu Nacional D'Art de Catalunya is free to under-15s, over-65s and to everyone on the first Sunday of the month. See more about free days in Barcelona museums below. Take the kids for a run in a very pleasant park in the center of Barcelona. It features Barcelona's Arc de Triomf (much nicer than the one in Paris) fountains, museums (not free) and a zoo (also not free). It isn't the most attractive beach in the world (artificially made, rumor has it that it is half sand and half concrete) but everyone loves to spend half a day catching some rays, right? There is also a nudist beach here (a bit of a walk from the main touristy area). Read more about other Beaches in Barcelona. Entrance to the Barcelona Cathedral is free, so you can marvel at the Romanesque cathedral from both outside and within. 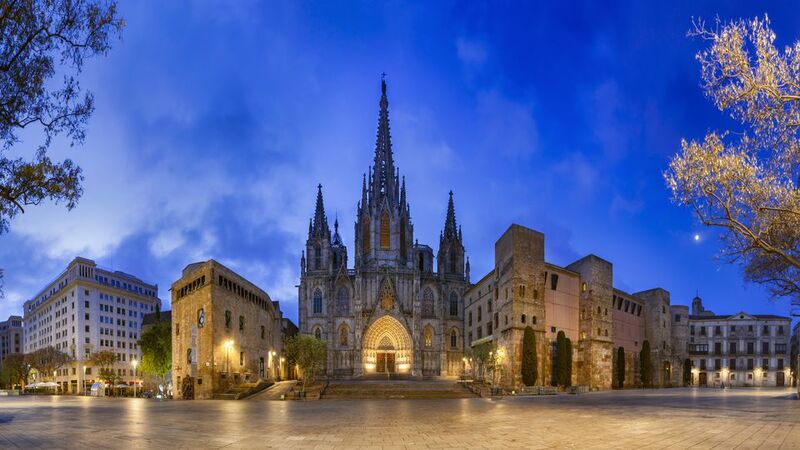 Read more about Barcelona Cathedral. Several museums have at least one free day a week or month. The most famous of which is the Picasso museum, the best showcase of works by the Spanish cubist artist. It is only free on the first Sunday of the month. Be warned, the line to get in is gigantic - get there early. The museum is also free to under-16s and to study groups (only on Wednesday afternoons). Inquire at the museum for more information. Read more about the Picasso Museum in Barcelona. If you're traveling on a tight budget, you'll be pleased to learn that there are plenty of free things to do in Barcelona. Many museums in Barcelona have free entry either once a month or every day of the week. A showcase for art considered too experimental for mainstream art galleries. This famous indoor market hall is a colourful explosion of fruit, vegetables, seafood, rows and rows of cured jamón and some mind-boggling butchers’ displays. There are tapas bars, pizza stalls and all manner of produce you can try before you buy. In the heart of Barri Gòtic, the colossal neo-Gothic La Catedral is as impressive outside as it is within. Free entry in the morning and late afternoon makes it worth venturing inside to take in its soaring domed ceilings, pillars and cloister with courtyard of palms, orange trees and resident gaggle of white geese. It lacks the historic impact of the neighbouring Barri Gòtic, but the network of lively streets around El Raval is home to an eclectic cast of characters including artists, backpackers, punks, students and more. There are plenty of cool bars and vintage clothing stores, not to mention the colossal MACBA (Museu d’Art Contemporani de Barcelona; as impressive from outside as within). Built for Barcelona’s 1929 World Exposition, this water-, sound- and lightshow has been drawing tourists ever since. Sure, the Magic Fountain borders on the kitsch side – but what’s not to love about jets of multicoloured water rising in sync to cheesy 1980s numbers and show-tunes? Barcelona’s graffiti artists are a proud bunch and you’ll find some great examples of their work around town, particularly in El Raval and Poblenou. The city also has a long tradition of street art and sculpture. Some better-known examples include Peix, a giant fish sculpture designed by Frank Gehry overlooking the beach; Roy Lichtenstein’s 15m-high Barcelona Head at the Port Vell; Catalan artist Antoni Tàpies’ Monument Homage to Picasso on the Passeig de Picasso; and Fernando Botero’s enormous cat on the Rambla del Raval. The revamped (and relocated, just slightly, to a gleaming new home next to the Design Museum) Encants flea market has an intriguing mix of trash and treasure. While it’s not without its fair share of odd shoes and outdated electronic devices, there are enough random oddities to make it worthwhile. A new addition is a surprisingly gourmet food court up on the first floor. All big cities have a green area to do some jogging, have a picnic and, basically, chill-out on sunny days. In Barcelona, Ciutadella Park fills up on weekends with people who are not so crazy about the beach and prefer a bit of greenery. On special dates the park also serves as the perfect scenery for festivals (think food trucks and activities galore).